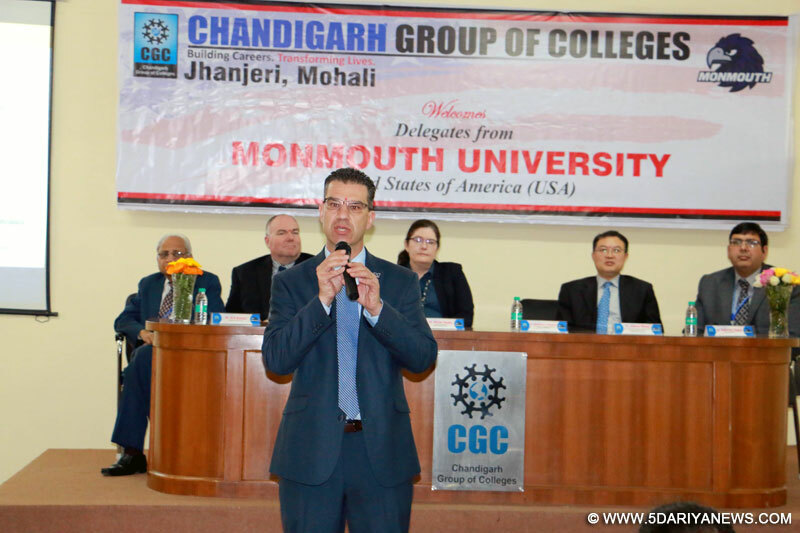 The students of B.Tech, MBA, BBA, B.Com & other undergraduate courses at CGC Jhanjeri got the opportunity, when Representatives from Monmouth University USA to explain avenues for their placements & higher studies in USA. Dr. Michael A. Palladino, Vice Provost for Graduate Studies and Dr. Jon Stauff Provost for Global Education told the students that they could undertake their internships and summer training in USA under the guidance & supervision of this university. Dr. Jiacun Wang, Professor of Software Engineering said that the students of B.Tech of any discipline could pursue their masters programme in Computer Science & Software Engineering at Monmouth University. He highlighted that a student with Master Degree could get about 20 to 25% higher salaries than a graduate engineer. Dr. Susan Gupta, MBA program Director invited undergraduate students of various courses for admission in MBA at this University. She informed that the Business School of this University was having AACSB Accreditation which was possessed by only 5% Business Schools worldwide. Further, this B-School was recognized by Princeton Review & US News & World Report as the Best Business School. The delegates informed the students about tuition fee & other expenses there. The highlight of the talk was the information that the students of this University could get scholarships & assistantships by working in campus for various tuition jobs or working with some professors as assistants in their research work.Rashpal Singh Dhaliwal, President CGC said that the purpose of such seminars was to give world class exposure to CGC students and provide them an opportunity to explore avenues for their higher studies & placements in USA.